It has been raining in Bangalore for like ever and its super awesome weather here. It gets quite chilly sometimes surprisingly at this time of the year God knows what’s in store for December. And I am again down with a running nose and cough – It has become a monthly affair almost. So what’s better than some hot piping soup in this weather to keep my throat happy? Okay the Knorrs, and Chings and Maggi soups are little mainstream – nothing beats the old fashioned freshly made soups minus the corn flour. I am a big fan of fresh soups whenever I have time. 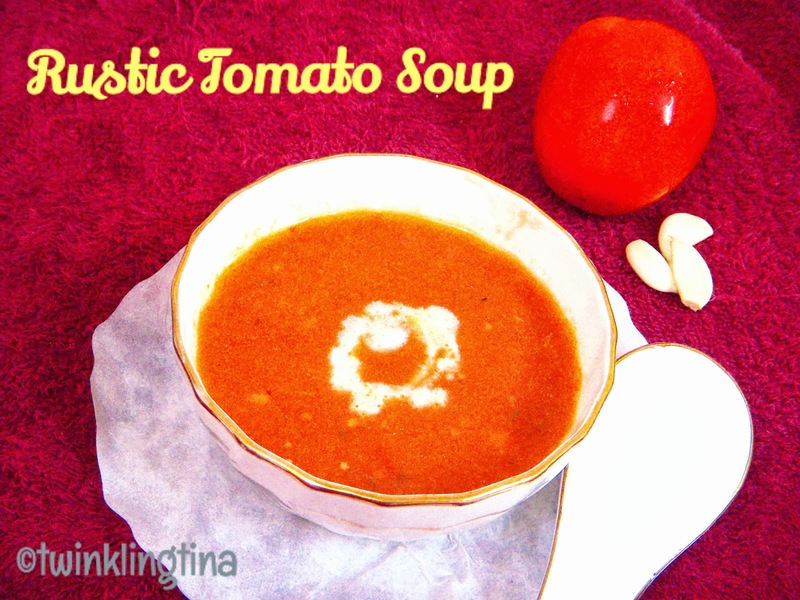 So here goes a simple recipe of a rustic tomato soup for all the soup lovers. And yeah it’s thick and no the watery kinds. 7. Basil – I have used dried basil about 1 tspn. If you have fresh basil then nothing like it. Add the diced tomatoes in the pot and mix them well till they are juicy and gooey. Once the tomato is cooked take a hand blender and blend it well. Transfer the mixture in a bowl and set aside. Add some butter and let it melt. Add the flour and fry it in the butter to make the rue. This will give a very nice flavor and will add a good texture to the soup. It will also make it thick. Add your soup to this rue and mix well so that there are no lumps. Add seasoning and herbs and mix well. Add a little fresh cream on top and serve hot with croutons/ toast or just enjoy it as it is. And hey you are done before you can think anything else. Wasn’t that easy? I am sure you’ll enjoy.